Presenting Doctor Who; The Blood Cell by James Goss. "Release the Doctor — or the killing will start." What does impress the Governor is the way the new prisoner immediately sets about trying to escape. And keeps trying. Finally, he sends for the Doctor and asks him why? But the answer surprises even the Governor. And then there's the threat — unless the Governor listens to the Doctor, a lot of people will die. After The Crawling Terror, 'The Blood Cell' is another 12th Doctor (Peter Capaldi) and it has a lot to recommend it. An eye-catching cover and the first line of the synopsis is one too. I wasn't disappointed at all. Hooked till the last page. Till the last line. But there is something more that sets it apart from the rest. Unlike all the other Doctor Who who I have read, the whole thing is told in the perspective of another character (the Governor). Written in 1st Person point of view of the incharge of the Prison, the Governor. The author totally did justice to not only the Doctor and Clara but to the Governor's backstory in the lot as well. Also because it is the Prison in general that is fashioned as the central character of the story. With its ins and outs and all the mysterious threat that surrounds its inmates. The author did a great job of emulating this incarnation too. Here I felt he put Capaldi's Doctor in words the best. This one is much darker, impulsive with an angry face. And there is that ingenuity too. He is much like the classic Doctor incarnations and has successfully carved a niche for himself. Clara is also not far behind and Goss' lines fits her in quite amazingly. The Governor in question is another one marvelously incorporated as the narrator. The Blood Cell is much more darker then all the others I have read. With heightened emotions and its dark theme, we feel everything that happens and its not all pleasant I tell you. The Prison itself has some great dirty, deceptive secrets and it makes the story even more attention grabber than ever. 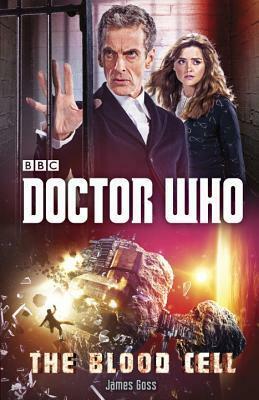 "A scintillating adventure in the dark reaches of The Prison"
I watch Doctor Who and have been enjoying it since a child, but I could never quite enjoy the books as much as I enjoyed the movies. I felt like an element of the telly version was lost when translated into words, so I have always avoided them. I am glad to see someone likes them though! A darker Doctor is one I would surely love above all! I need to get my hands on this asap. I so need to watch this tv series, I have heard nothing but great things about it! Glad you loved this.